Are you tired of going to Holy Cow and Luigia all the time? Why not sample some of our tried and tested restaurants, that are not on the beaten track. With the new year approaching, it seems like a good time to explore some new and tasty options. 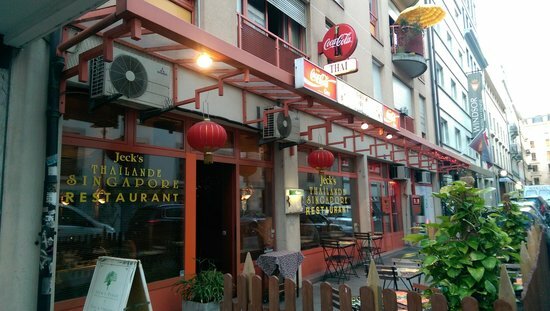 Geneva has many lesser known food options with delicious menus just waiting to be discovered. The Hamburger foundation may seem like yet another burger joint, but their mouth-watering gourmet burgers, served with a cup of french fries, a green salad and coleslaw are far superior. It’s a modern, bustling restaurant that doesn’t disappoint, even offering some staple American deserts to feast on after your juicy burger. It might cost a pretty penny, although it’s nice to have a burger that isn’t from Holy Cow! El Catrin is a small Mexican restaurant located near Cornavin, bringing the flavours of Mexican street food to you (tacos, tortas and tostadas), however in a restaurant environment. Their tacos are cocooned by corn tortillas and stuffed with dried chilli, veggies, fruit (pineapple) and your choice of meat/fish. It’s the real thing, not the Tex-Mex American effort. Of course, there’s guacamole and nachos too; what more could you need? Unfortunately, seating is limited due to the small scale of the restaurant so we would recommend to book in advance or simply arrive early. Again, the prices are significantly higher than they would be on the street, so be warned. But, the tacos are undoubtedly worth it! An amazing Ethiopian restaurant bringing unique tastes and flavours to Geneva. Plates of hot injera bread piled with an assortment of vegetables and your choice of curry (vegetarian options too) entice the customer into the door. It’s a fun place to go with friends as the menu mainly consists of large plates of shared finger food in the traditionally decorated environment. A true refuge from fondue! Advertised as “Fine Indian Cuisine” in a Bollywood-like environment, the Bollywood Café serves tasty Indian food whilst customers enjoy Indian cinematography and music; allowing the customer to be immersed in Indian culture. Bollywood Café has a huge range of dishes; from everyone’s favourite buttery Naan, Murgh Madras (chicken curry), samosas, and even salmon! However, the food is good, not exceptional, and more than a little expensive. But if you feel like a nice dose of India Bollywood Café might be for you. A tiny restaurant that offers super fresh Vietnamese food in a simple, comfortable restaurant. Cheap and straightforward; perfect for a quick bite with friends. Dishes include curries, soups, rice-based plates with fried spring rolls, veggies and noodles. The staff are efficient and friendly. The Vietnamese soup is a must. Whilst this is not a sophisticated sit-down restaurant, it is extremely cheap and serves wholesome shawarma. The restaurant itself is basic, just tables and chairs and a large open kebab grilling kitchen, perfect for a quick bite to eat (the restaurant targets take-out or quick eating). Shawarma are stuffed to the brim with your choice of meat, tomatoes, onions, lettuce, garlic sauce and pickles. If you prefer not to have a shawarma, you can always get a platter including veggies, salad, rice and falafels. Simply put its low-maintenance fast food, but it is inexpensive, speedy and authentic. Enjoy! We would love to hear your opinions on our recommendations. Posted in Uncategorized and tagged eating, Food, geneva, lachat, restaurants, tasty, theupdate, thingstodo, yum. Bookmark the permalink. It’s not a kebab it’s a shawarma. They are two different things.